Using a mixture of warm satin gray, and glossy red cabinetry in the basement bar makes an instant impression. Miele dishwasher, under counter refrigerator drawers, quartz tops, and thick floating shelves keep this entertaining space harmonized with modern spirit. The open and gracious kitchen enables multiple cooks to comfortably share this contemporary space. 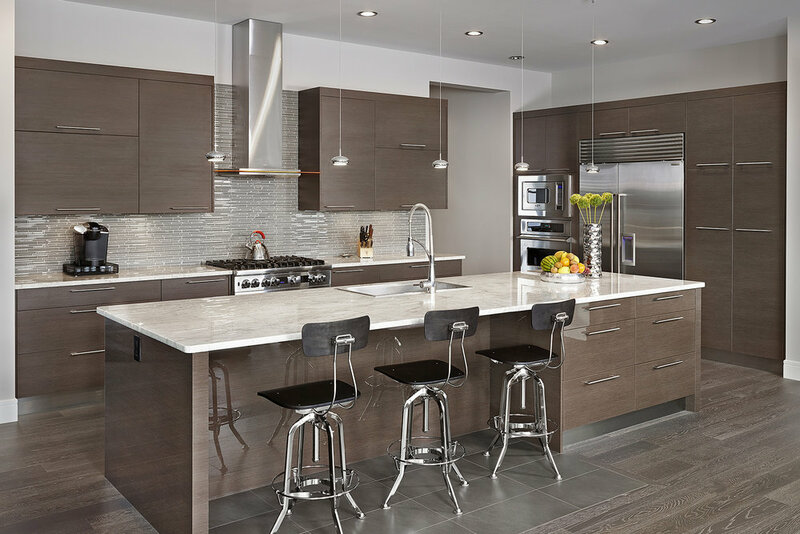 High gloss island cabinetry, stainless steel toe kicks, and hidden under cabinet lighting with plug moulding are all in keeping with the modern design. We are in love with everything in this home. The kitchen is open and inviting and the bar creates an instant impression.